You are currently browsing articles tagged Route 66. 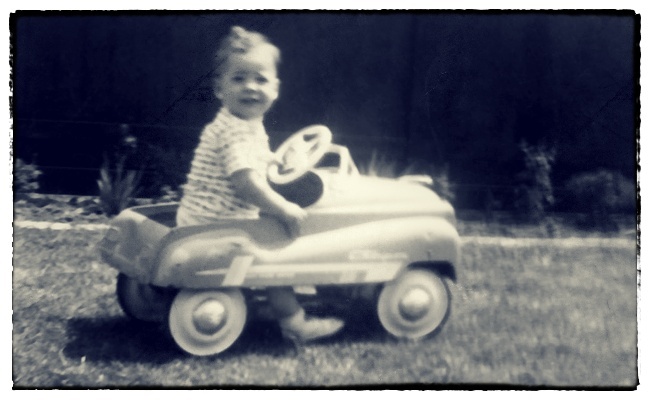 Me, at 15 months, preparing for my first road trip–alone, of course. When I was nine, or maybe ten, and living in Southern California, I convinced our next-door neighbor, who was leaving her husband, to take me with her to Casper, Wyoming. She drove a blue Corvair, the car that made Ralph Nader famous when he condemned it in a book as “Unsafe At Any Speed,” and I remember Marge—that was the woman’s name—crying so hard as we drove through the desert north of Barstow that the car continually went off the highway. Sometimes she’d just drive through the soft sand, plowing over cacti and tumbleweeds. I thought it was great fun. When I was sixteen, living in Central Oregon, I stole my father’s pickup and drove to Olympia, Washington, to a Woodstock-like music festival over Labor Day weekend. A few years later, I left my dorm room at college in the middle of the night and hitchhiked down to Disneyland, without telling a soul, just because I was tired of the rain. When my mother died, I got in the car and drove the length of Baja and then back again. I have no idea why I chose to drive through Mexico, but I did. I like road trips. Always have. Particularly by myself. I like putting on some Joni Mitchell and getting all melancholy about nothing in particular (from her song Hejira: I’m traveling in some vehicle/I’m sitting in some café/A defector from the petty wars/That shell shock love away/There’s comfort in melancholy/When there’s no need to explain/It’s just as natural as the weather/In this moody sky today). I like driving through forests, along a river, down into a valley of chaparral, through endless miles of desert. When I was 25, I went on an overland trip from Nairobi to London; my favorite part was getting lost in the Sahara. You know it never has been easy/Whether you do or do not resign/Whether you travel the breadth of extremities/Or stick to some straighter line. When I was growing up, my family spent almost every Labor Day weekend camping along the Colorado River in Arizona. I remember our station wagon breaking down and being towed to some dinky little gas station near Blythe or maybe Parker. My dad hung canvas bags filled with water in front of the grill to cool the engine but the radiator overheated anyway and my sister and I would sit on top of our metal Coleman cooler, a square block of ice keeping mostly beer and sodas cool, trying to lick our Creamsicles before they melted down our arms, while my dad conversed with the mechanic. It was always over a hundred along the river so we’d sleep on air mattresses in our swimsuits, no sheets or blankets, close enough to the river’s edge that you could reach out and touch the water passing swiftly by. I tell you all this because Labor Day is approaching and I have an ache in my body to get in the car and head for the desert. It started when I read a story over the weekend about the Hatch Chile Festival, in Hatch Valley, New Mexico, which starts on Saturday with a parade down Main Street. I read that story and without even knowing I was doing it, I found myself looking at a map of the southwest and tracing the route with my finger, murmuring the names of places I might pass through: Desert Hot Springs, Joshua Tree, Blythe, Sonoran Desert, Saguaro National Park, Las Cruces, Hatch Valley. A lot of road. A lot of desert. I think I just may do it.